As a business owner, or facilities management professional, you’re used to keeping things running smoothly. An inviting space is an important part of your business for both employees and customers. Nothing stops things cold, quite like a malfunctioning HVAC system. To stay ahead of this, Ellis Air Conditioning and Heating provides businesses like yours with our Commercial HVAC Scheduled Maintenance Service Agreements. While normal wear and tear is expected, a small issue found during a scheduled maintenance call, a tune-up, can be found before it becomes a major issue such as full-scale shutdown. Ellis’s tune-ups are budget friendly, and our professionally-trained technicians are committed to keeping your systems running efficiently. An efficient system keeps your space comfortable and maintains good air quality. This leads to a reduction in energy consumption and can help you save on monthly utility expenses as well. Four Performance Tune-Ups Per Year – These regular check-ups also enable us to catch potential issues, such as loose or burnt wires, or freon leaks, before they lead to larger problems, such as motor failure. We do a comprehensive check of each component of your system. Air Filters changed – All filtration devices are inspected and properly serviced up to four times per year. Our quarterly commercial performance tune-up starts at $325.00 for the first system and $279.00 per additional systems, freon not included. We also offer additional pricing structures based on the number of units, equipment and size of the HVAC system, call today to find out more. Our commitment to excellence means Ellis Air Conditioning and Heating provides you with comprehensive services at competitive prices to keep you and your business’s budget cool. To get started with our Commercial HVAC Scheduled Maintenance Service Agreements, call us at (972) 291-9316. For more details of what each tune-up includes, please see the information below. Our quarterly commercial performance tune-up starts at $325.00 for the first system and $279.00 per additional systems, freon not included. We also offer annual service agreements, which pricing varies based on the number of units, equipment and size of the HVAC system. Please contact us to discuss our service agreements in more detail. We offer multi-year discounts and will recommend a program that best fits your needs. Commercial service agreements are quoted separately. Professionally Trained Technicians Repair It Right The First Time. Our factory trained, certified technicians have an average of 15 years experience in the air conditioning and heating business. We examine your entire system to properly diagnose the real problem. We are dedicated to making sure your whole system is working correctly to reduce future breakdowns and repairs. Up Front, No Hassle Price Guarantee. ELLIS Air Conditioning & Heating offers straight forward, up-front guaranteed pricing on all installations, services and repairs even if the job requires extra hours to complete. Six months, no payment/no interest financing is available as well as long term financing on all new equipment. When Your Air Conditioning Is Out And It Is 100 ° F – You Don’t Have To Wait Until Next Week. With 15 radio dispatched service trucks and over 1,000 parts on board, we can promptly repair and service over 40 makes and models of equipment or install a new system with same day service in most cases. This means quick on-site repairs with no repeat trips for parts. Reliable, Quality Equipment. 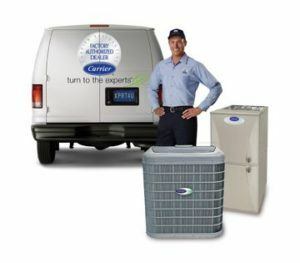 A Carrier WeatherMaker system, which features Puron refrigerant, has a proven track record of performance and reliability. Puron is a non-ozone depleting, environmentally refrigerant used throughout Carrier’s entire line of residential products. Since 1996, over 300,000 Puron-based air conditioners and heat pumps have been installed nationwide. To date, they have even proven to be not only the quietest, but the most reliable Carrier has built, delivering the lowest failure rates ever. That’s quite impressive considering Carrier Corporation invented modern air conditioning and continues to be the wordl’s leading air conditioning and heating manufacturer. Save Up To 60% On Home Cooling Costs. ELLIS Air Conditioning & Heating can provide your home with a WeatherMaker system by Carrier. The WeatherMaker system is so efficient; the two speed models can save you up tp 60% on your home cooling costs each year. When an average of 42% of your utility bill is spent on air conditioning and heating, this means big savings.